I've recently been given the opportunity to develop and promote the Library Science collection at Cambridge University Library and I'm really enjoying the experience so far. I've been given a fairly broad remit which means that I've been able to try out a lot of initiatives that I've read about or studied (such as using Pinterest to promote the collection). Another thing I've been quite keen to develop is access to material on the reading lists of various library courses. Luckily we're a Legal Deposit library which means that we hold many of the titles already, it's really a matter of making sure the last few make it into the collection. In order to make it easier for users to retrieve the items on their reading lists I've been experimenting with tagging books in the catalogue and adding them to lists. 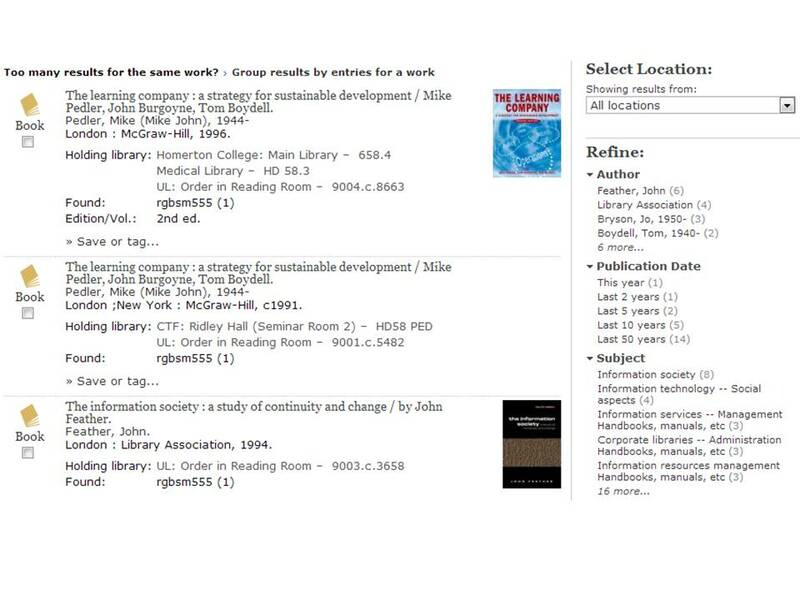 The UL uses LibrarySearch which provides tagging and list functions through it's My Discoveries tab. I decided to use course codes to tag the items as I thought this would cause the least confusion. At the moment I've only made lists according to university rather than individual course but this is something I can develop in the future is needed. One major disadvantage that I've found is that LibrarySearch doesn't allow you to tag certain items, which results in an incomplete list. I'm looking into a solution for this and will hopefully be able to find one. The plan is to launch a dedicated website for the collection through the University Library website which will include links to reading list materials. Fingers crossed I can make it work before then! think this tagging of books in reading lists is genius - hope we copy you you soon.